Ricardo just sent me a link to the British Heart Foundation statistics website. It's a goldmine. They have data on just about every aspect of health and lifestyle in the U.K. I find it very empowering to have access to this kind of information on the internet. By golly, we've proven that exercise causes obesity! 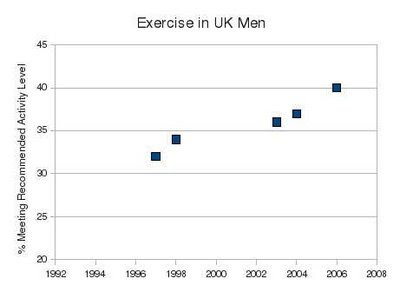 Clearly, the more people exercise, the fatter they get. The R-value is a measure of how closely the points fall on the best-fit line. 0.82 isn't bad for this type of data. If only we could get all British citizens to become couch potatoes, obesity would be a thing of the past! OK, I'm kidding. The obesity is obviously caused by something else. I'm illustrating the point that correlations can sometimes be misleading. Even if an association conforms to our preconceived notions of how the world works, that does not necessarily justify saying one factor causes another. Controlled experiments can often help us strengthen a claim of causality. Could be that much of the exercise is weight lifting which will cause wt gain. 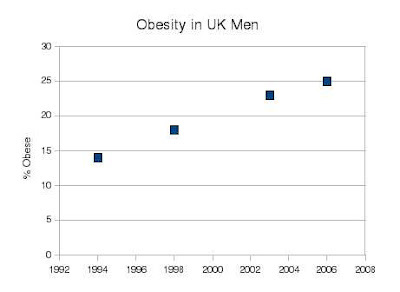 Since a lot of things probably help cause obesity, there's probably a lot of graphs that correlate with this. 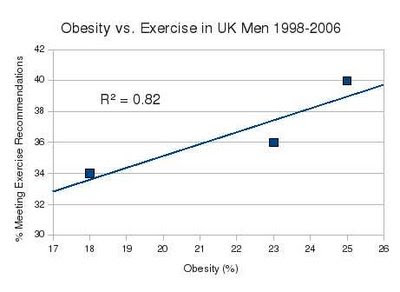 What is "exercise" in the graph anyway? Probably not marathons. Maybe just more hours in the gym, which people can stack up on and then stop doing, and then stack up on again and make that add up to be more per year, but not necessarily consistent, hence, the yoyo. Just look at Oprah. So yeah, it's a little vague, that's all. Looking at individuals and their results I find more convincing then larger statistics since anything goes with thoseee. Just thinking about exercise causes people to eat more! People tend to greatly over estimate the amount of calories burned doing exercise and calculators that show calories burned during exercise are highly optimistic or else fail to subtract the base calorie burn. To lose weight you still need to end more days than not with a calorie deficit which very few people can do for a sustained period of time. It can be achieved through exercise I imagine but it is a hundred times easier to do through diet. Most people end the day with a calorie surplus every single day of their adult lives even with exercise with the inevitable consequence of continuous weight gain. You have a ton of great phytic acid information on your blog and I have used some of it to do a post on mine. I have given you credit and linked to you and all that, but if you want anything changed, removed, or if you want to add anything, just let me know! I lived in Ireland from 1987 until 1996 and I witnessed a gradual shift in the eating habits in Ireland and Britain. That is only my personal unscientific observation. Over the years they were cutting out fat (me including! ), switching away from traditional cooking based on butter, eggs, bacon, steaks and saussages in favor of cereals, scones and pizzas. Jogging and other forms of exercising became very popular in the 1990-ties; gyms and health shops proliferated. One thing specific to the British Islands and Ireland is the lack of sunshine. We know now due to (among others) Stephan's and Peter's efforts, about the role of vitamin D3. In order to live healthy in those always cloudy and rainy countries (sorry Peter), I think it is essential to consume D3 from the natural sources such as animal fat, meat and/or fish. Otherwise people degenerate and develop chronic disease. For example middle aged Indians and Pakistani living in Britain have about 40% diabetes rate and probably about ten times the rate of MS. Losing weight is largely an exercise in appetite control. Low-carb makes appetite control plausible. Chronic cardio increases appetite. What a gem! People all the time overlook the possibility of data being framed to fit and prove any angle of thought! Even though I don't agree with Taubes on everything-- I would agree that just adding exercise alone wouldn't really make that much of an impact with people (especially if they are still eating lots or eating badly). As an aside, this is like much of the data that is coming out on intermittent fasting now because much of the data suggests that the benefits are primarily due to a reduction of calories. #1 goal for everyone-- Eat clean (Foods in nature, low anti-nutrients), Eat less! Eating less doesn't necessarily prevent obesity. Just throwing that out there. 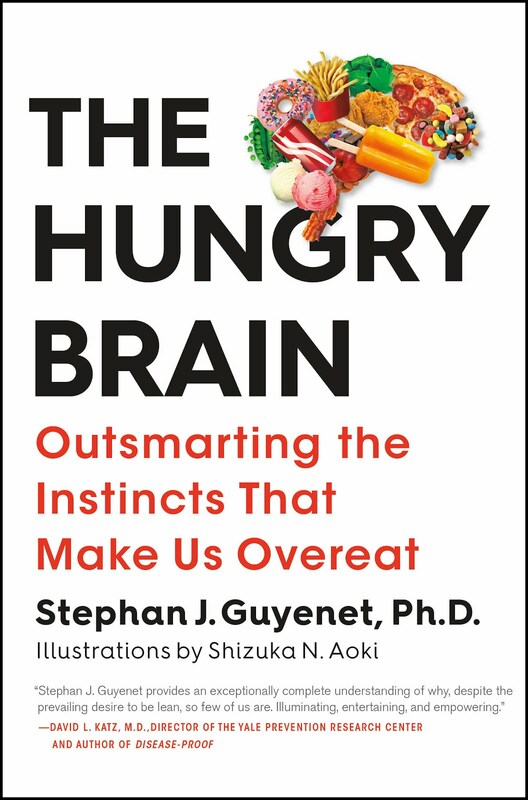 Everyone assumes obese or overweight people are gluttonous but they probably don't even have to consume that much to be overweight if the food is bad enough. It should just be eating enough of the right food, but not less of the right food. ...two peas in a pod. My what can be done with data in the hands of the irresponsible and dishonest. One simple explanation is that exercise makes people hungry. Hungry people will eat. If they continue eating the wrong things they will struggle with their weight. I frequently experience this. I run marathons. I often find it very difficult to maintain and lose weight and sometimes even put on weight when I am training a high load (60-100 mi / week); whereas in my off-training periods when I do very little running or other exercise, it is very easy for me to lose weight. I am simply less hungry when I am not training and find it easier to eat deliberately and eat well. Somehow I doubt average weight is going up because everyone is getting buff. I see Ireland wasn't immune to the low-fat craze. Unfortunate. That makes sense. If exercising makes you eat more of the foods that make you fat to begin with, it could cause weight gain indirectly. True. The body will slow its basal metabolic rate if it's in a state of wanting to conserve energy. It will also reduce physical movement. I actually have a friend who gains weight around the midsection when he trains for a marathon too. He's normally lean and muscular, but when he does long cardio he loses muscle and gains fat around the midsection. Thanks again, that FAO page is fantastic. Yeah, skinny-fat! It's a dangerous body type. I thought your whole point to this post was that correlation does not imply causation. YES! Very important. Unfortunately so much of our research into primitive man only gives us correlations. We can't do randomized controlled trials on our ancestors.Now back to your pseudotheory that exercise is correlated with obeisity and you want to check out whether there is causation. Next maybe you look for confounding variables, what else could be going on with these people? What were they eating? (Mc Donalds), How much (Supersize). Perhaps you still want to check out your hypothesis (Exercise causes Obeisity), then maybe you see if you can generalize it. This is what Weston Price did so elegantly by travelling the world to prove his hypothesis. Do all different cultures who increase their exercise all end up obese? Finally you must have a tenable theory of causality. How could exercise cause obeisity? One more example. Say you are hired to figure out just how serial murders were being committed. You know nothing about guns. You are never in the room when a murder takes place but are near by. First you hear a bang, next you rush to the room, third you notice alot of smoke from the smoking gun on the floor, next you notice a new victim lying dead. OK, lets look at correlation. Bangs are correlated with dead people. The R squared is fantastic! Anyone want to add a silencer to our gun to prevent the next murder? Hey, smoke is correlated with being killed with a smoking gun. How about a smoke evacuator? Correlation is not causation. What happens when we generalize. Detective Joe Blow had some cases where a silencer or smoke evacuator was used and the victims still died. What about plausibility? Theory, they died of smoke inhalation or where scared to death by the bang. OOPS the autopsies don't support either theory but there were bullets in all the victim's hearts. Bullets....now we have correlation, generalizability, and plausibility. I think you're right that correlations can sometimes bring us toward an understanding of causality. You're also right that all of Price's data are correlative. There are two things that make data such as Price's unique though. One is that you see the same characteristic pattern happening to cultures that are so different they have almost nothing in common with one another to begin with: healthy on their native foods, unhealthy on white flour, sugar and other processed food. When you see massive correlations dozens of times between such different cultures that are mutually buttressed by Price's work, the medical literature and the anthropological lit, the story becomes pretty believable. The other thing that makes Price's work unique is he studied "negative controls", that is, populations that have an exceptionally rare incidence of tooth decay and degenerative disease. It's qualitatively different than looking for 30% changes in disease incidence between people within an industrial population. Based on Price's data, you can make statements such as "the traditional Polynesian diet does not lead to appreciable tooth decay" and "incorporating white flour and sugar into the traditional Polynesian diet caused a massive increase in tooth decay". When you travel around the globe and are able to substitute dozens of different cultures for "Polynesian" in the statements above, the relationship becomes highly likely to be causal, in my opinion. Modern diet/health epidemiology doesn't usually permit us to make categorical statements like that, because they're usually looking at people who are already "sick" to varying degrees. It becomes very difficult to establish causality when you're not looking at whopping differences. I believe that's the reason the epi studies and intervention trials so often disagree, and it's the reason I'm naturally skeptical about diet/health epidemiology studies. One of the things I love about Weston Price is just what you pointed out. His hypothysis - (modern diseases are the product of modern civilization, specifically modern diet) gains strength with every different culture he encountered all with very different diets, all of whom had excellent dental arches, teeth, and freedom from modern diseases such as cancer, cardiovascular disease, and diabetes. I call this the fact that you can generalize his hypothesis. It is slightly the wrong word but you get my point. Plausibility comes into play as these primitive cultures rapidly deteriorate when they come into contact with modern civilization. It is remarkable how adaptive human beings are, We are the penultimate opportunistic omnivore. 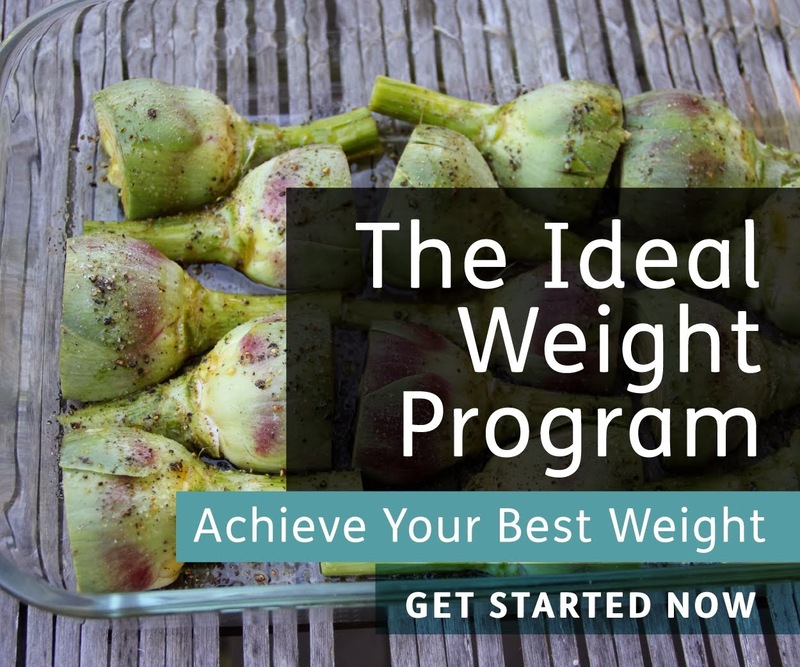 The Intuits, the Polynesians, the primitive African tribes thrived on vastly different diets. Only modern man has been able, in his ultimate wisdom, come up with a diet which is truly maladaptive. OK, what about confounding variables and the Weston Price hypothesis. I can't help it, I have to play devil's advocate. Hypothesis, put another way: Primitive Man was free from the diseases of modern civilization because his diet, although highly variable, was much better than ours. Possible confounding variables, where he lived (city vs country), how many hours a day he was outside,and how much did he exercise. Yes I know. I'm trying to figure out how I can stay healthy and live longer without having to live like a starved rat on a treadmill. At least the starved rat was meant to eat grains. I bet they could even eat McDonald's french fries! Maybe I could just pretend that I exercised, take a vitamin D gelcap, and have a Carl's Jr. Superstar on a romaine lettuce leaf. Then again I think not. I'm getting off the computer and on my bicycle out in the sunshine. Thanks for being you. It could also be that there are 2 sets of people, those who are into being physically fit, and those who are into televisions and Doritos. Those who are fit are exercising more, and those who aren't are eating more. you guys are funny. exercise leads to weight gain is funny too. that guy who gains around the middle when training for a marathon, could that be because of his high energy needs and carbo loading? don't marathoners believe in carbo loading? I knew this guy who ran marathons who loved beer so he was thin but pudgy around the middle.not real big or anything just a little pudge. I just discoverd something, beer drinking leads to visceral fat accumulation. what a revelation! just kidding. moderate exercise is good for reversing insulin resistance so my doctor told me,it never increases my appetite, I eat same whether i exercise or not, but I dont run marathons, or walk more than an hour per day or run on my treadmill no more than 15 minutes or 20 depending on energetic I feel. people who say they gain fat when exercising and following theri brand of diet (whether low cal or just normal eating for them) maybe it is their bodies response to the increased need for back up fuel or maybe they are undereating and their bodies are just trying to recover from their famine (diet)? chloe your right everyone assumes an obese person visits fast foods all the time and are always packing food into their mouths or eating crappy all the time. aint so. most of my fat friends including myself eat better than many of my thin friends.my skinny friends visit fast foods me and my fat friends do not, they eat junky and high carb foods, we don't. my fat friends are always trying to eat healthier and exercise if they can. some just stay fat no matter what they do, even if they manage (myself included) to lose some weight by famining (dieting) it is only temporary until we can't stand the hunger no more. our bodies simply will not cooperate. What Can Evolution Teach us About the Human Diet?